Shyam Gollakota leads the Networks and Mobile Systems Lab at UW CSE. His research covers a variety of topics, including networking, human-computer interaction, battery-free computing and mobile health. 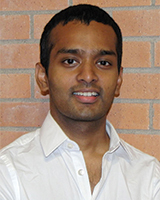 Shyam is the recipient of a 2015 National Science Foundation Career Award and an Alfred P. Sloan Fellowship. He was named among MIT Technology Review’s 35 Innovators Under 35 and Forbes’ 30 Under 30 in energy for his ground-breaking work on ambient backscatter, which enables battery-free devices to be powered using ambient wireless signals. Shyam’s research has earned a number of Best Paper awards and has been covered extensively by the media, including the New York Times, Slate, Scientific American and Wired. He earned his M.S. and Ph.D. degrees from MIT and his bachelor’s degree from IIT Madras. To learn more about Shyam and his work, visit his website.